President Donald Trump tweeted Wednesday morning that there was no longer a nuclear threat from North Korea. "Just landed – a long trip, but everybody can now feel much safer than the day I took office. There is no longer a Nuclear Threat from North Korea," Trump tweeted. "Meeting with Kim Jong Un was an interesting and very positive experience. North Korea has great potential for the future!" In the wake of Tuesday's Trump-Kim summit in Singapore, North Korean dictator Kim Jong Un has yet to dispose of the country's nuclear weapons or its ballistic missiles that have the ability to strike the United States. Trump became the first U.S. president to meet face-to-face with a North Korean head of state during the summit. The Trump administration has pushed for North Korea to denuclearize, while promising security and prosperity in return. The joint statement Trump and Kim signed gave few details on how the two countries will move forward with denuclearization of the peninsula. "President Trump committed to provide security guarantees to the DPRK and Chairman Kim Jong Un reaffirmed his firm and unwavering commitment to complete denuclearization of the Korean Peninsula," the statement said. Trump continued to tweet and said the country could "sleep well" now because he thinks North Korea is no longer a threat. "Before taking office people were assuming that we were going to War with North Korea. President Obama said that North Korea was our biggest and most dangerous problem. No longer – sleep well tonight!" Trump tweeted. 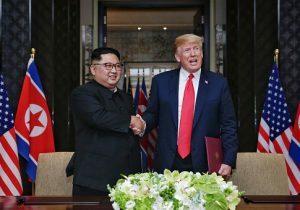 Critics of the summit argue Trump giving Kim a face-to-face meeting will legitimize the dictator without any serious concessions from North Korea, cautioning that the Kim family has promised denuclearization multiple times in the past. They also believe Trump gave up a significant concession in his decision to cancel joint military exercises between the U.S. and South Korea. Trump defended his decision by saying the country will save a fortune and that it's the right decision because he believes both sides are negotiating in good faith. "We save a fortune by not doing war games, as long as we are negotiating in good faith – which both sides are!" Trump tweeted.